Review: A Jewish prince is betrayed and sent into slavery by his Roman friend. He regains his freedom and is back for revenge. A classic film that should not be missed. This is a must see. The direction all the way through this is amazing. This has got the best sound score in any film and one of the most memorable scenes in movie history (the chariot race in which someone did actually die during filming). During this scene they had to construct an 18-acre chariot arena which eventually filled with 8,000 extras for the 20 minute race. It also took 5 weeks to film. 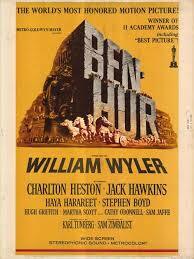 Paul Newman was offered the role of Judah Ben-Hur but turned it down. Kirk Douglas was offered the role of Messala but turned it down. This film is based on a novel from 1880 by Lew Wallace. The only other two films that have managed to get as many as 11 Academy Awards are Titanic (1997) and The Lord of the Rings: The Return of the King (2003). At the Academy Awards in 1960 this won 11 Oscars. They were for Best Picture, Best Actor in a Leading Role (Charlton Heston), Best Actor in a Supporting Role (Hugh Griffith), Best Director, Best Cinematography, Color, Best Art Direction-Set Decoration, Color, Best Costume Design, Color, Best Sound, Best Film Editing, Best Effects, Special Effects and Best Music, Scoring of a Dramatic or Comedy Picture. At the Golden Globe Awards the same year it won 3 awards. They were Best Motion Picture – Drama, Best Director and Best Supporting Actor (Stephen Boyd). Andrew Marton won a special award for directing the chariot race. At the Bafa Awards the same year this only won one award for Best Film from any Source.